My name is Paul Kiernan and I am a resident of Tallaght, Dublin, Republic of Ireland. I was politically arrested on Monday 16th February 2015 and face a possible charge of false imprisonment (which has a maximum sentence of 15 years imprisonment) of our Tanaiste Joan Burton (Labour party leader, Deputy Prime Minister and Minister for Social Protection). I am 1 of 23 people arrested (with a reported 41 due to be arrested) so far which include men and women aged in their 40,s, 50,s and 60,s and children aging from 12-18 years old. There was also 1 TD (MP) and 3 local councilors from the AAA (Anti Austerity Alliance) arrested. At this very moment there are 4 people imprisoned and 1 which will be when he returns from holiday with sentences of 28 days and 56 days for breaching a court injunction which banned them from been within 20 meters from Irish Water Meter Installers. These arrests and imprisonments and others taken place throughout Ireland are taken place against people that are taken part in civil disobedience against a corrupt and inept political system and government. As you may know there has been a number of national protest marches and many more local marches in the recent months against the water charges which have been attended by hundreds of thousands but what you may not know is that the water charges is the straw that broke the camels back and that although we march under the 1 banner, we march/protest for many reasons. Since the bank collapse and bail out of bond holders (largest fraud in Irish and one of the largest in world history) our nation has endured years of austerity measures that has seen an increase in drug addiction, homicides, tiger kidnappings, aggravated assaults, sexual assaults, aggravated burglaries, armed robberies, serious gang crimes and other serious and minor crimes in cities, towns and rural Ireland. Despite this we have seen the closure of over 100 Garda (police) stations throughout rural Ireland and a reduction in the force. At the same time this is happening we see Garda been used in high numbers as security for the likes of the Corrab Shell to Sea gas line and civil disobedience protests where they assaulted numerous protesters and at water meter installations throughout the country. They have been used to politically arrest many water protesters with as many as 10 officers at a time dispatched to preform the arrest warrants with dawn raids. They are also used to arrest citizens (quite often mothers) for the likes of non-payment of Television licence (which is a civil matter) who then face days in prison at a far higher cost to the tax payer than the licence itself while corrupt politicians, business people and bankers walk free. With austerity we have seen a rise in the likes of Income Taxes, D.I.R.T (Deposit Interest Retention Tax) and C.A.T. (Capital Acquisitions Tax, Inheritance) Tax, C.G.T. (Capital Gains Tax), Carbon Tax, Motor Tax and the introduction of new taxes such as Property Tax, U.S.C. (Universal Social Charge) Tax, Air Travel Tax, Credit Card and Cheques Tax, various Stamp Duties and the introduction and rise of charges such as Banking charges, Bin charges and Plastic Bag Levy. Vehicle owners have also seen an increase in fuel costs, parking fees, parking fines, clamping fees and speeding fines which raise many millions yearly. Despite the massive rise in taxes and their intake we have seen a sharp decline in Social Services for the most vulnerable in our society suffer with cuts to the likes Children Allowance, Fuel Allowance, Lone Parents Allowance, Live Alone Allowance, Old Age Pension, Job Seekers Benefit/Allowance (with the under 25s taken a 40%+ cut) and Carers Allowance. With all these cuts we have an ever increasing need for charity with a huge increase in families seeking help from the likes of The St Vincent de Paul for food and bill payments. The health system is also in disarray and has seen a sharp rise (record numbers) of patients on hospital trolleys awaiting admission and patients are waiting longer for appointments with consultants and such. The cost of G.P. and hospital admissions for non medical card holders have risen and the number of people eligible for Medical Cards have been slashed and people with long term/fatal illnesses/diseases and people with disabilities have had their cards taken away and find themselves going through an appeals system to have them renewed. We have seen the introduction of Emergency call out charges, Prescription charges and the end of the Funeral grant. While we see a rise in self harm and depression we see the government cut funding to charities like Child Line and the Samaritians. Rural Ireland has also paid a high price with a rise in violent crime such as home invasions as the many Garda stations close but they have also seen the closures of hospitals (with some also closing for the evening shifts), closures of banks, post offices and the end or reduction of bus services that are vital in linking rural Ireland with the larger towns and cities. Education in Ireland has also suffered with the reduction of school teachers which has lead to an increase in class sizes particularly in the rural areas. Despite Ireland’s large exports of dairy and meat the farmers rely on EU hand outs as they can’t get a fair price for their milk, cattle or poultry and have suffered for many years now with many deaths from accidents which has lead to the introduction of new safety measures which most simply can’t afford. Our fisheries has also suffered under the EU fishing rotas which sees Irish fisher men sail to sea and watch huge foreign trawlers fish in our waters and make billions from them. Please note that everything above is only a small part of a very large list of hardships our people have suffered over the last 7 years or so. These are all due to the criminal activities of elite bankers and the negligence of a corrupt and inept government in the bank collapse and bail out here. We face decades of poverty and debt that has nothing to do with us as bond holders have their lost bets paid out as winners. These same banks which received billions from the state are now involved in the highest number of repossessions of property, rise in homelessness and emigration since the great famine. At the same time the banks have reduced the number of loans to small businesses, farms and home owners and as businesses go bankrupt, people lose jobs and banks take homes they then sell them to the foreign and domestic elite who then rent them for large amounts that most can’t afford. While the people suffer the politicians (the same politicians that say protesters are the sinister element, the enemy, akin to fascists and I.S.I.S. terrorists in their speeches) and corrupt bankers walk free with huge wages and pensions and bond holders take their riches. We are in the middle of a campaign that seeks to end all the wrongs on our people and nation and we seek international recognition and media coverage as our own media is mostly owned by Irish Tax exile (shady billionaire business man) Denis O’Brien or the government/public funded RTE which have been constantly bias against our movement. We would be delighted if you could find a way to cover through articles/broadcasts our future marches/ peaceful protests and possibly forward this email to like minded media partners or such as we have few international contacts. If needed we can have freelance film recorders and photographers forward footage directly to whom ever agrees. It was Monday 16th February and my wife, son and I had got up 6 am as we were due to visit the Royal Victorian Eye and Ear hospital for an appointment for my son as he has Glaucoma in his eyes. 1 eye is worse than the other and he had a procedure last year to stop it getting worse and we were told at the time that if it gets worse he could loose his eye in a few years time and require a transplant. Although my son is 21 years old he has A.D.H.D. , O.C.D , has been suffering panic attacks and has been refereed to a specialist for possible diagnoses of Autism or Asperger’s . My sons appointment was at 845 am and we were due to leave at 715 am to drive through rush hour traffic. At 710 am my wife saw a number of Gardai come into the garden and make their way to the door at which point having been informed I proceeded to get ready for my arrest. I got my wife to record my arrest and as I approached the door I shouted up to my son to inform him I wouldn’t be able to attend his appointment. I opened the door to find a number of Garda awaiting me. I explained my sons situation to them and was asked if there was someone other than me to bring my son to which I replied my wife was also going but that she also attended a special needs school and had learning disabilities and that it was important for me to be there are certain things they struggle with. The arresting officer told me this would be taken into account and we proceeded to the local Garda station in Tallaght. While making our way to the station the Garda in the car asked more about my son and I explained and I also talked about myself and the fact that I had been working for over 10 years in my community starting and running children and adult football teams, running a sports club for a local youth club, taken part in my local estate management, volunteering with the local homeless services and running charity events. I explained that I wasn’t the only one arrested that has worked hard in their communities for no personal gain. The Garda treated me very well but believe my circumstances were taken into account and got the feeling that they didn’t want to be arresting us. At one point two of them told me they didn’t agree with water charges either which is something protesters have heard many times. I was held and questioned and then released 4 hours later and was the quickest of all those arrested to be released, which again I believe was due to my circumstances but others were treated more harshly after their arrest. My wife and son were 45 minutes late for the appointment as they had to travel by bus and foot but my son was seen by the doctors and returned with good news as his eyes haven’t got any worse. I can ask others that were arrested, those that were victims of Garda brutality or those imprisoned to give statements on their situations if needed. 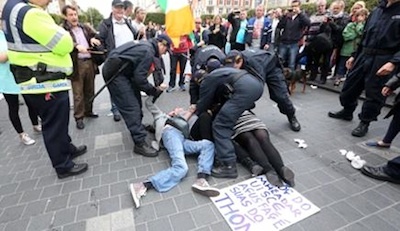 I like many others arrested for the Joan Burton protests had spent the entire week before my arrest protesting outside local Garda stations against the Political policing and arrests and had made it known on TV and radio that we were there if they wanted us. We would have expected that maybe an officer would come out and make arrangements for those waiting to be arrested to come down at agreed times so to save man hours for the force. This never happened and as many as 10 officers at a time were sent to arrest us (4 or 5 most mornings) at 6 or 7 am , even the children who missed a day of school. There is a double march/protest this Saturday 7th March at 1 pm at R.T.E. studios in Donnybrook, Dublin 4 and then a march/car convoy at 4 pm from the G.P.O. O’Connell St to Mount Joy prison where a candlelit vigil will take place for the politically jailed and arrested protesters. With the amount of positive feedback we have received we are confident these marches will have an attendance of over 10,000 with potentially many more and we have arranged for the RTE event to be Streamed live. There is a national march on the 21st March run by Right2Water in Dublin at 2 pm, previous marches have been attended by hundreds of thousands and will be expected to have the same or more again. There will be many more protests planned in the future.